In terms of ramifications for the regulated community, few if any technical guidance documents issued by the Pennsylvania Department of Environmental Protection (PADEP) rival in importance the Management of Fill Policy (also referred to as the Clean Fill Policy). The Management of Fill Policy establishes guidelines for delineating between fill material that can be used as unregulated “clean fill” and fill material that instead must be managed as a waste under the Pennsylvania Solid Waste Management Act (SWMA), 35 P.S. §§ 6018.101 – 6018.1003. The current version of the Management of Fill Policy was issued in 2004 and was slightly revised in 2010. 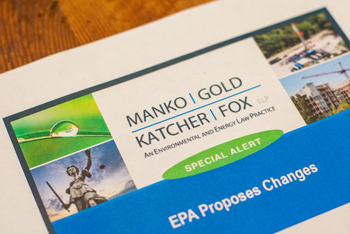 On December 20, 2014, PADEP issued proposed changes to the Management of Fill Policy for public comment. The proposed changes focused predominantly on modifying the numeric standards that are used to help determine whether fill material qualifies as “clean fill” or instead is regulated under the SWMA. The proposed changes also included modifications to the sampling and analytical protocols contained in the Management of Fill Policy. The proposed changes sparked significant public comments during the public comment period that closed on February 18, 2015. In response to the public comments it received, PADEP has been reconsidering how to proceed with the proposed changes to the Management of Fill Policy. It appears that instead of making limited revisions to the Management of Fill Policy as proposed, PADEP instead will embark on efforts to overhaul in a more fundamental manner the Management of Fill Policy. The updated version of the Management of Fill Policy is expected to be released in proposed form later this year for public comment. Based on discussions with PADEP, we anticipate that the numeric standards used to help define whether fill material is contaminated or instead qualifies as “clean fill” will be changed. The numeric standards in the current version of the Management of Fill Policy are generally based on the direct contact numeric values and generic soil-to-groundwater numeric values developed by PADEP to implement the statewide health cleanup standard under the Pennsylvania Land Recycling and Environmental Remediation Standards Act (Act 2), 35 P.S. §§ 6026.101 – 6026.908, for soils at residential properties overlying used aquifers. Since these standards were adopted in 2004, the numeric values under Act 2 have been amended on multiple occasions. The most recent amendments took effect on August 27, 2016. PADEP plans to use the most recent cleanup standards under Act 2 as a point of departure in developing new “clean fill” numeric standards. It also appears likely that PADEP will incorporate future changes to the cleanup standards under Act 2 by reference in the revised version of the Management of Fill Policy, meaning that the “clean fill” numeric standards will change approximately every three years and will likely be below background levels for commonly occurring regulated substances including benzo(a)pyrene and vanadium. Whether PADEP fully embraces the “tool box” available under Act 2 for setting residential cleanup standards for soils as it establishes new numeric standards for “clean fill” remains an open question. If PADEP revises the numeric standards under the Management of Fill Policy as expected, PADEP will need to tackle the difficult issue of how to address background levels of regulated substances that might be higher than the new “clean fill” standards. Significant problems will be created if PADEP fails to include a necessary a “safety valve” for such situations. In addition, we anticipate that the revised Management of Fill Policy will address on some level how new numeric standards for “clean fill” will be phased in with respect to ongoing or completed projects. For example, where new numeric standards are more restrictive than current standards, such changes will necessarily place into question the status of fill material that was used in accordance with the current numeric standards but which might not qualify as “clean fill” under the new numeric standards. Likewise, the status of fill material that has been acquired in reliance on the current clean fill standards but may not be used by the time the new standards take effect will need to be resolved. Given the importance of the Management of Fill Policy, it will be critical for the regulated community to carefully review the changes to the Management of Fill Policy that are expected to be proposed and to take advantage of the additional public comment period that PADEP is envisioning to solicit input regarding those changes.